The desperate expat wife is blond enough to know next to nothing about cars. She likes to name her cars, they’re always female, and always small and cute and quite old, but she’ll forget from one time to the next how to open the hood. She’s very protective of her cute little car and doesn’t much care about big bully cars owning the roads. The desperate expat wife doesn’t like macho-macho either. Not that that’s really a problem in Luxembourg, although sometimes the above-mentioned type of car is a wannabe macho warning. But there is one place where the two worlds meet – that of cars and of macho men – and that is… Sandweiler. Switch to movie scene: grim music, colours fading to grey. Poor little Sandweiler probably hasn’t deserved to be synonymous with such grimness, but it just so happens that this is where Macho HQ is located: Contrôle technique! Movie scene: Escalating music, a scream in the distance, zooming in on ugly grey building. For some curious reason, as soon as the front wheels enter this male territory, the desperate expat wife’s sparse knowledge about her car disappears, as do all of her car words in French. And they don’t come back while waiting (and waiting… and waiting) in line, in fact she almost forgets how to drive altogether. She looks nervously around her for a comforting and/or understanding smile, but all she can see is rows of serious-looking men behind steering wheels. 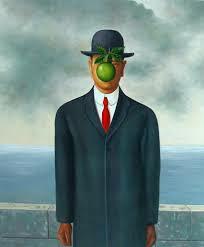 Movie-scene: switch to the absurd, Magrittesque faces ( faceless man with apple and bowler hat). And that’s just an innocent prelude to the looks of the men in overalls who wait for her after the building has opened it’s big ugly mouth to swallow her and her cute little car. Patronizing, careless, annoyed, overbearing, bored. These are men with power. And while the desperate expat wife frantically struggles with her more or less temporary memory loss and tries to understand what the h… their reluctant signals mean, her inner voice screams “don’t you little lady me!” Oh right, they don’t – because they don’t speak, at best they mumble, first in Luxembourgish, then begrudgingly in French – yet they still do little lady her. Movie scene: still absurd, mouths talking, not a sound coming out, then a crescendoing mumble, then a scream from behind the windscreen (Munch this time). The relief when she reaches the last overall! She longs for a look of empathy from the cashier, a bit of female bonding in a man’s world, but she doesn’t even look up. It doesn’t matter, the feeling when she has readjusted her eyes to daylight and sees the shabby shopping mall across the street again is one of pure euphoria. She escaped the Sandweiler regime! Movie scene: birds singing, butterflies dancing in front of her car, dreaded building glooming behind it. Heading for the roundabout as fast as her cute little car will take her, she ponders whether short skirts and high heels would be better. But no, the overalls are probably beyond that, or the looks she’ll have won’t be any better. Besides no need to go even blonder. Going on Sandweiler strike seems like a much better idea, and she starts bargaining with her husband the very same day – better start early. She’s even desperate enough to iron his shirts for a whole year if he’ll just take that cute little car to macho land. Shot on location in March 2013. There will be no retakes.